living for the enjoyment of life that is also more kind to the environment, local populations and cultures. Of all the various modes of travel, the most intimate is also our most natural. Walking in Tuscany allows you an often overlooked and underrated relationship with your surroundings – and here they are truly amazing. Walking forces you to interact, take your time, and truly inhale the world around. Nowhere else on the globe are these intangible benefits more celebrated the famed Italian countryside of Tuscany. Southern Tuscany is an undiscovered jewel, the area provides both a cultural feast and a natural one. A world off the beaten track, where wooded hills, valleys, rivers and lakes frame a unique historical and archeological paradise. From the Etruscans to the Romans and from the Middle Ages through the Renaissance to our present times, history of mankind has left, layer after layer, its trace in an incredible succession. It is difficult to find elsewhere so many memories of different eras all together and in such a special setting. From the artistic capital of the renaissance in Firenze, to the Gothic cathedral spires in Siena, this sprawling region is characterized by rolling hills, storybook vineyards, and unbeatable authentic Italian culture. Monte Amiata provides a paradise for walkers in the summer, the golden beaches of the Maremma coastline are bathed by a transparent sea and it is regarded to be the cleanest coastline in all of Italy. The hill towns and valleys of southern Tuscany are a wonderful cross-section of Italy's charms, constantly offering striking views of the rolling hills, olive groves and vineyards of classic Tuscany. Tuscany's varied terrain and climate makes it the ideal location for a variety of outdoor sports. These activities include walking and hiking, cycling, climbing and mountaineering, water sports and horse riding. The surrounding countryside of Podere Santa Pia offers ample opportunity for recreation. You can tour local vineyards and wineries, embark on walking or hiking tours, bicycle excursions and horseback riding. Coastal areas have a mild summer and winter climate, whereas moving further inland the weather is increasingly continental. Inland areas experience hot summers and cold winters. The best time to hike through Tuscany is in the summer and fall. We made a good selection of the best hiking trails in Tuscany. The Val d`Orcia is a vast valley in the province of Siena, situated in southern Tuscany, between Valdichiana, Crete senesi and Mount Amiata. Its name comes from the river that flows through it, the Orcia river, a tributary of the Ombrone river, the most important waterway in southern Tuscany. This spectacular landscape of Tuscany has long been a source of inspiration for writers and painters. Its green, gentle hills covered with miles and miles of vineyards and olive groves, the ancient walled villages and the Castles and fortresses will make you go back in time and have a taste of its glorious present and past. The valley embraces the town territories of Castiglione d'Orcia, Montalcino, Pienza, Radicofani e San Quirico d'Orcia. In 2004, Val d'Orcia, was included by UNESCO as world heritage landscape area, with the following reasons: the Val d'Orcia is an exceptional example of how the landscape was redesigned in the Renaissance period to reflect the ideals of good governance and create an aesthetically pleasing pictures. The landscape of Val d'Orcia was celebrated by painters of the Sienese school, which flourished during the Renaissance. Images of the Val d'Orcia and particularly depictions of landscapes in which people are depicted as living in harmony with nature, have become icons of the Renaissance and have profoundly influenced the development of landscape thinking in future years. Within the Val d'Orcia is a strip of land following the Orcia river between the DOCG zones of Brunello di Montalcino and Vino Nobile di Montepulciano. Here the Sangiovese and Trebbiano-based wines are produced under the Orcia Denominazione di origine controllata (DOC) status. Orcia D.O.C. is produced on the territories of Abbadia San Salvatore, Buonconvento Castiglione d’Orcia, Chianciano Terme, Montalcino, Pienza, Radicofani, San Casciano dei Bagni, San Giovanni d’Asso, San Quirico d’Orcia, Sarteano, Torrita di Siena and Trequanda. The mountain is clothed in a forest of beeches, oaks, firs and chestnut trees, stretching from a height of a thousand meters to the top of the mountain. The summit of Monte Amiata is 1738 meters above sea level and this extinct volcano today marks the border between the provinces of Siena and Grosseto in southern Tuscany. This is where the territory of the Maremma meets the Val D’Orcia. The Etruscans considered Monte Amiata their Mount Olympus and the fertile land, mineral deposits and thickly forested slopes have been inhabited by a proud and independent people since prehistoric times. The volcanic eruptions finished 180 thousand years ago and many huge boulders still dot the slopes where they landed. The mountain is an ideal place to discover on foot. A network of hiking itineraries cover both sides of the mountain. The Agenzia per Il Turismo Monte Amiata proposes 34 itineraries of varying difficulty following the old mule trails and traditional paths which make up over 200 kilometers of trekking. About 12 hours are needed to complete the circle, the Anello dell'Amiata, indicated by the characteristic red and white signs, but there is also a choice of stretches for shorter walks. The area of Pitigliano and far to the south of Rome is characterised by tuff stone, a hardened type of volcanic magma. Southern Tuscany was once one of the most important centres of the Etruscans. There are numerous cave-tombs of that period around Pitigliano, caves cut deep into the tuff, that are today used as cellars and sheds. The Tuff Area is named after tufo, a volcanic, porous rock commonly used as a building material. The tuff has been carved over the centuries to build houses, cellars, tombs or used to make "tufi", big square bricks which are typical of the villages and towns of this area of the hills of the Maremma. To the north are the slopes of Monte Amiata, to the south is the region of Lazio, to the east lie the shores of Lago Bolsena and to the west is the Tyrrhenian Sea. Bypassed by the main toll road system, the character of this area has remained refreshingly genuine and its natural and historical treasures are still intact. According to the description by Dionysius Halicarnassus, the greek historian, the Etruscans were an ancient and unique people, without no language and lifestyle affinity with other people. The term Etruscan indicates a population that lived in Etruria, between the 9th and the 3rd century B.C. The Etruscan civilization represents one of the most important cultures in Italy. Who wants to get to know the Etruscan side of Tuscany will enjoy the towns and villages that were founded by them. A fascinating journey to Pitigliano, Sovana, Sorano and Castell’Azzara, to name a few, on a path of art, history and landscape. The major centres of this area, which has still not experienced mass tourism, are Pitigliano, Sorano and Manciano. The perfectly preserved necropolises in Sovana and Poggio al Buco, the vie cave (amazing roads carved in tuff that pass through the woods), and medieval villages like Magliano in Toscana contribute to make this area one of the most beautiful in Tuscany. It also boasts naturalistic treasures such as the hot springs and spas of Saturnia, and the hills of the river Fiora, which supplies water to the vast majority of the Maremman villages and towns. Lake Bolsena is on two sign-posted walking routes: one is the Via Francigena- the well-known medieval pilgrim road which runs from Canterbury to Rome, and the other is a newly- opened route called the " Sentiero dei Briganti",created by the local Tourist Board to take in the most significant areas of natural beauty and historical interest, and funded by the European Union and the Regione Lazio. The Brigands' Path follows the Tuscan-Latium border for about 90 kms from the Nature Reserve of Monte Rufeno to the medieval castle and Etruscan museum of Vulci (Canino).It passes through splendid countryside and archeological sites and ends with views of the Tyrrenian sea. Besides these major routes there are also many shorter walks and trails to places of interest around the lake. Bolsena is crossed by the Via Cassia, the ancient Roman road which during the Middle Ages became known as Via Francigena. The municipalities of the towns of Acquapendente and Bolsena (located at the border between Latium and Tuscany) have restored (for pedestrians only) the old Via Cassia where it diverges from the current one. Via Francigena walks have become very popular among the residents and the many foreigners who live in the area. It takes 8 days to complete the final stage in Lazio. The route passes by Acquapendente formerly known as Acquapendentem, meaning, “pending water.” to arrive at Bolsena. Approaching Proceno, modern day pilgrim hikers leave Tuscany, cross into Lazio, and enter a region sometimes known as Tuscia, the heart of Etruscan empire. The Maremma landscape is varied. Hills gently degrading towards the sea, whose main colours are intense green in spring and golden yellow in summer, with the presence of olive-groves and vineyards and also woods of cork-oaks and flowering ash full of mushrooms if it rains in summer. The fertile plain too is accurately cultivated and studded with the white rural houses. Many pine forests grow along the coast, wide shores of very fine siliceous sand with its characteristic sand dunes rich in Mediterranean macchia, the brush. Maremma includes 160 km of shoreline. The stretches of sandy and rocky coastline allow all sea lovers to find the perfect place for them. Moreover, the vast pine tree forests which border the beaches of the Maremma are a real naturalistic treasure and so are the few areas where the lagoon and swamp ecosystems have survived urbanization, reclamation or simple draining, such as the nature reserve of the Diaccia Botrona near Castiglione della Pescaia, and the Parco Naturale della Maremma between Alberese and Talamone. Grosseto can be considered the capital of the Maremma. The area around Grosseto and the coast, with Marina di Grosseto, Castiglione della Pescaia and the small villages that lie in the plain between the city and the coast, represents the heart of the Tuscan Maremma. Inside the Follonica Gulf, in the Bandite di Scarlino reserve, which is divided by a small promontory from Punta Ala, among a multitude of small caves, you will find Cala Violina. The beach's name derives from its very rare characteristic (it appears there is only one another beach with such a peculiarity) by which, steeping on the sand, the latter will echo back the harmonious notes of a violin. In the south, the Tombolo della Feniglia is considered to be the more chic and beautiful beach. La Feniglia is an enormous sand dune 6-8 km long and 1½ km wide that connects Monte Argentario to the mainland at Ansedonia in the south of the peninsula. The beach is the most famous in the area. 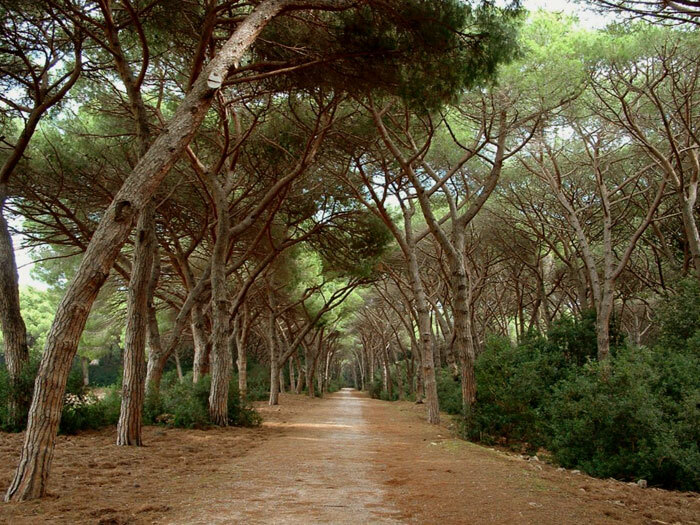 A major feature of La Feniglia are the Mediterranean pine trees that run down the centre of the dune providing welcome shade during the heat of the day. There is a road that runs down the middle of the dune, where cars are not allowed. Florence, the capital Tuscany, is known for its role in bringing Europe out of the Dark Ages and into the Renaissance era, paving the way for world-changing art, architecture, exploration, politics, and business. The Renaissance first occurred inFlorence and continued to be more pervasive there than anywhere else. The city's economy and its writers, painters, architects, and philosophers all made Florence a model of Renaissance culture. Most of the major tourist sights in Florence are within easy walking distance of each other. It is possible to walk from one end of the historic center of Florence to the other - North-South or East-West in a half hour. Walking is not only an easy way to get around, it also offers the chance to 'take in' much more of the city life. Be warned though, that electric motor scooters are small enough to fit where cars cannot. They are silent but quick and in the summer they often times travel into the plazas. Some of the streets in central Florence are closed off to traffic, and many more are simply too narrow for buses to get through. Therefore, bus and car tours are not recommended. This is a very small, very compact city that really needs to be seen by foot. This selection of tours has been put together with a deep passion for Tuscany's history and culture.